Jack Futterman--1969. SSA History Archives. 12/45-2/46 Procedural Consultant, Division of Accounting Operations, BOASI. 11/36-7/42 Division of Accounting Operations, BOASI, various clerical and supervisory positions. I was not fortunate enough to have worked with Jack Futterman during his storied career at SSA. Jack retired in 1972, five years before I started my SSA career, and 36 years after he started his own. Jack Futterman was one of SSA's true pioneers--starting out in the Candler Building in November 1936. Jack was present at the founding of this great enterprise of Social Security. It was Jack and his co-workers in the Division of Accounting Operations who built the ship, so to speak, that would carry this enterprise through time. Jack's special talents and intellectual brilliance were recognized almost from his first day on the job, as he recounts in his wonderful oral history memoir. Jack would play important roles in the organization, usually behind the scenes, rising to the job of Assistant Commissioner for Administration--the next level below SSA's Commissioner at the time, Bob Ball. It's amazing how many institutional structures and processes that still exist in SSA today were introduced by Jack Futterman. But I will let him tell you that story, because he was a great story-teller, who delighted in recounting the tales of his career at SSA. I first met Jack in 1996, when he was already 84 years old. But he was a vigorous, active and intellectually sharp octogenarian. In fact, I had a hard time getting in to see him as he would have to consult his busy appointment calendar before finding an open slot for me. Keeping pace with him intellectually was even tougher as he had a sharp and relentless mind that seldom slowed down to give me much of a chance to catch-up. In fact, his "interviews" weren't really so much interviews as listening sessions where Jack had a chance to share with me from his fund of thoughts and memories. I think we were fortunate to record Jack's oral history when we did. Shortly thereafter Jack would come down with a serious illness, limiting his ability to do the final editing work on his transcript. I remember one day Jack said to me, "You know, I have been 65 years old for the last 20 years. This year I suddenly became 85." Jack Futterman was in some ways one of the sweetest guys I ever met. His initial impression, however, was a little different. Jack had a marvelously deep and raspy voice and a kind of superficial gruffness which could make him seem formidable. He also had a seriousness about him; and I suspect those who knew him in his working career would say he was a very demanding boss--both of them and of himself. But he also had a very gentle core--which you could see in the sensitivity of his work as an artist, which is one of the main ways he spent his retirement years. And you could also see it, most especially, when he smiled. I delighted in those moments when Jack, tickled by some observation or remark, would break into this impish smile. His smile was a momentary opening of this gruff shell that he presented on the surface, and you would see gentleness and sweetness inside. In the core of who he was, Jack Futterman was a sweet guy. Starting in the summer of 1996 and concluding in early 1997, I spent many long days with Jack at his home in Ellicott City, listening to his stories. Usually we sat in his living room, Jack in his easy-chair and me on the sofa, as he remembered the events of years before. Sometimes we worked in his studio, where he painted his oils and watercolors and where he had a small office. I even tried, mostly without success, to help him troubleshoot problems with converting his old CPM computer files to work on his new Windows-based computer. Occasionally, we worked in his impeccably well-organized garage and basement, sorting through boxes of papers and documents from his career. Jack's garage is the only one I have ever seen in which not a single item of any kind is laying around out of place. Everything was put neatly away. It betrayed a habit of neatness and organization which I am sure characterized his entire life. The experience of interviewing Jack was both delightful and challenging. Jack had a nimble and wide-ranging intellect; he could go off on big loops of thought, tying some observation or idea he was discussing with some big social or philosophical idea and connecting with another set of ideas about something else all together, then finally looping back to link up with where he started. It was fun to watch his mind at work and I enjoyed our conversations immensely. But I often had a hard time trying to keep Jack on the subject at hand. That's one reason why his interview is organized as it is--in topical segments rather than in a single narrative flow. I also must admit that Jack was not entirely satisfied with the resulting product from our sessions together. Jack was very meticulous, especially in his written work. He was known as a demanding editor, who would return for more changes documents that others thought were well-finished. It was a point of pride with him. But oral histories are not written works--they are transcripts of the spoken word, which are inevitably less grammatical and less orderly than a written work. But they are also more spontaneous, more colorful and more lively than written works--which is their charm. Oral histories also are prone to various errors. There are errors of memory when the interviewee is, on the spur of the moment, trying to recall events from many years in the past. There are technical errors due to the convoluted procedures involved in creating oral histories. The history is tape-recorded, usually in less than ideal conditions, then the tape is transcribed by a clerk, edited initially by the interviewer, and then edited again by the interviewee, before a finished product emerges. We were unable to complete this whole sequence for Jack's interview. Due to advancing age and failing health, Jack was not able to finish editing the transcript before his death. Often, also, when reading the transcript of an oral interview the interviewee is surprised and disappointed to see how disorganized and rambling the text is. This is the nature of oral reminiscences--they are not as polished as written products, nor do we expect them to be. But some interviewees have trouble accepting this. That was certainly true of Jack. He was very frustrated with the first draft of his oral history. He refused to accept the idea that, being an oral history, it was okay for it to be a little disorderly. He wanted it to be a perfected written product. In several conversations we had about his oral history, Jack insisted that I put a disclaimer on the text of his interview, making clear that in his view the interview was not up to his standards. I have dutifully included his disclaimer in the introduction to the transcript. But I cannot resist offering a disclaimer of my own. Even though Jack may not have appreciated it, his oral history interview is a work of the highest quality. It may still contain minor errors, for which I hope Jack will forgive me. But even so, it is an important contribution to the literature on the history of the Social Security program in America. I think of it as Jack's final contribution to the Agency and the program he loved. It is, in my judgment, a fitting tribute to this most remarkable and accomplished man. 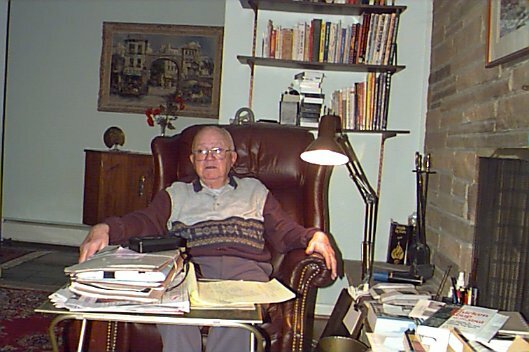 Jack Futterman at home during his oral history interview, 1996. SSA History Archives. 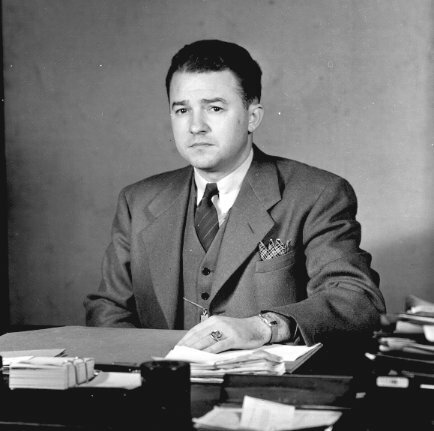 Jack Futterman in 1946 during his tenure as the Chief of the Control Branch in DAO, in the Candler Building in downtown Baltimore. SSA History Archives. Jack Futterman with secretarial staff, April 1958. Left to right: Nancy Long; Terri Farina; Jack Futterman; Gladys Sander. SSA History Archives. 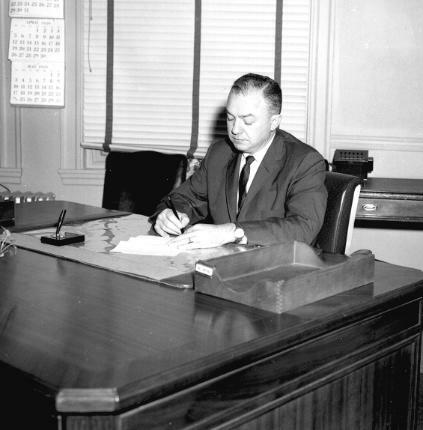 Jack at his desk in early 1959 when he was the Executive Assistant in the Bureau of Old-Age and Survivors Insurance (BOASI). SSA History Archives. Christmas party in Equitable Building in 1959. Left to right: Victor Christgau, Terri Farina, Nell Gallagher, Leona MacKinnon, Mary Alice Bearden, Rita Pulos, Carol Boch, Gladys Sander, Clif Gross, Robert M. Ball, Jackie Ball, Doris Ball, Delphien Bjerragaard, Jack Futterman, Nancy Long. SSA History Archives. Seated, left to right: Victor Christgau, Mr. Coquet, Jack Futterman, unk. person. Standing in rear, left to right: unk. 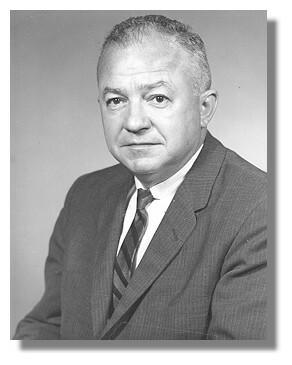 person, Roy L. Swift. November 1961. SSA History Archives. Jack Futterman with William Mitchell (left) and Victor Christgau (right) on the occasion of Mr. Mitchell's Retirement, 3/30/62. Photo taken at HEW headquarters in Washington, D.C. SSA History Archives. Jack at a Regional Conference in Portsmouth, New Hampshire, 10/8/62. Also shown (left to right): Art Hess, Asst. Dir. Division of Disability Operations; Hugh McKenna, Asst. Dir. Division of Field Operations; Tom Parrott, Asst. Dir. Division of Claims Policy; and Augustus Beaulieu, District Manager Portsmouth, N.H. Portsmouth Hearald Photo. SSA History Archives. Regional Reps. conference, January 15, 1962 in Baltimore. Pictured, left to right: Albert Kuhle; Jim Murray; Maurice Dewberry; Robert Fraker; Karl Bredenberg; John Campbell; Victor Christgau; Hugh McKenna; Byron Goetz; Perrin Lowrey; Wayman Register; Rich Toomey; Ernie Tallman; and Jack Futterman. SSA History Archives. 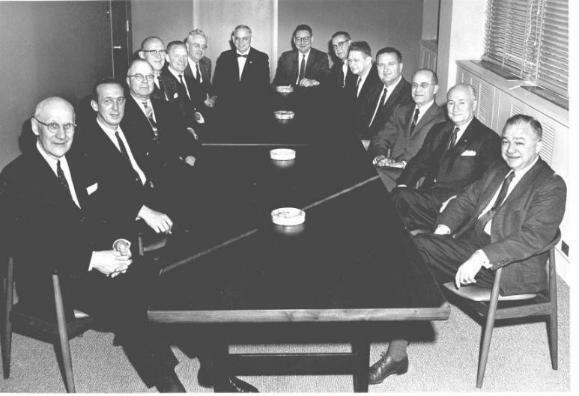 An assemblage of top SSA executives in 1963. Pictured are left to right), first row: Jack Futterman; Roy Touchet; Arthur Altmeyer; Bob Ball; Victor Christgau. Second row: Tom Parrott; Richard Branham; Bob Myers; Joe Carmody; Joe McElvain; J. Deane Gannon. Third row: George Rawson; Roy Swift; Harold Packer; Ida Merriam; Alvin David; Hugh McKenna and Bernie Popick. SSA History Archives. Jack Futterman receives Department of HEW Distinguished Service Award from Secretary of HEW, Anthony Celebrezze, April 11, 1963. SSA History Archives. 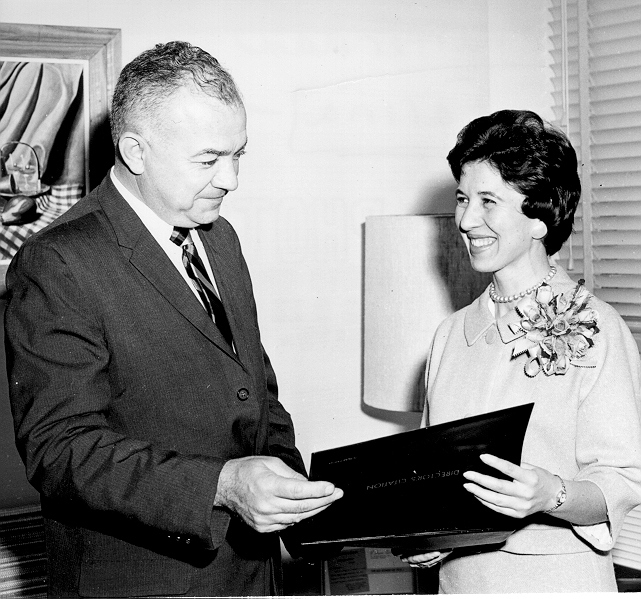 Jack with his long-time Secretary, Terri Farina. SSA History Archives. Jack Futterman in 1965. SSA History Archives. 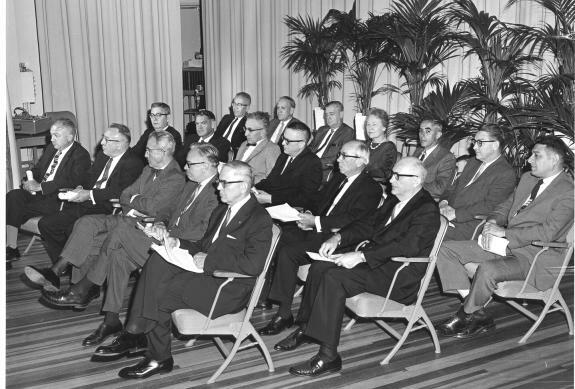 SSA Executive Staff in 1965--Front row (left to right):J. Deane Gannon, Director, Bureau of Federal Credit Unions; Jack S. Futterman, Assistant Commissioner, Office of Administration; Victor Christgau, Executive Director, SSA; Robert M. Ball, Commissioner of Social Security; Ida C. Merriam, Assistant Commissioner, Office of Research and Statistics; Arthur E. Ness, Director, Bureau of Disability and Health Insurance. Back row (left to right): Joseph L. Fay, Director, Bureau of Data Processing and Accounts; Alvin M. David, Assistant Commissioner, Office of Program Evaluation and Planning; Hugh F. McKenna, Director, Bureau of District Office Operations; Thomas C. Parrott, Assistant Commissioner, Field; Richard E. Branham, Director, Bureau of Retirement and Survivors Insurance; Charles M. Erisman, Deputy Director, Bureau of Hearings and Appeals (representing Joseph E. McElvain, Director); and Roy L. Swift, Information Officer, Office of Information. Absent when photo taken: Robert J. Myers, Chief Actuary, and Harold P. Packer, Assistant General Counsel. SSA History Archives. Jack Futterman meets President Lyndon Johnson, 1965. SSA History Archives. Jack explains SSA's computer operations to Secretary of HEW, Wilbur Cohen. 1968. 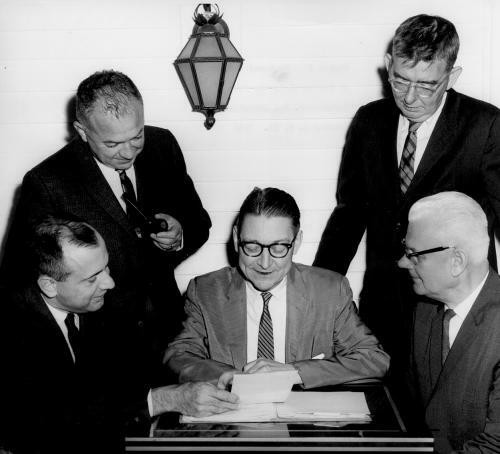 Shown, left to right, Harry Wage, Dennis Bevans, Sol Kreps, Arthur Hess, Secretary Cohen, Bill Hanna, Jack Futterman, Robert Ball, and Joseph Carmody. SSA History Archives. Bob Ball (left), Millie Tyssowski and Jack Futterman review SSA's 1971 budget proposal. 1970 photo. SSA History Archives. 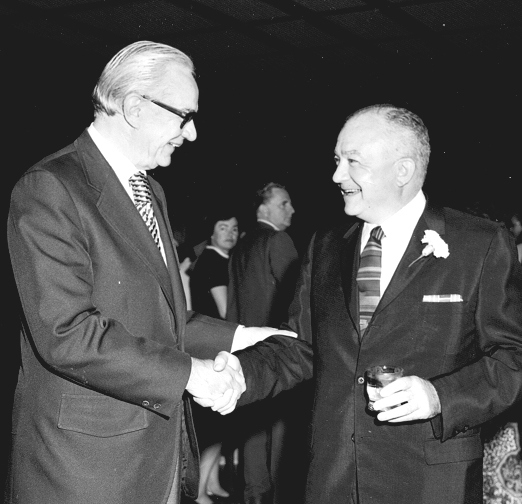 Jack being congratulated by Commissioner Bob Ball at his retirement party in June 1972. SSA History Archives. Jack Futterman founded the SSA Alumni Association. During its 25th Anniversary celebration, Jack was the keynote speaker. 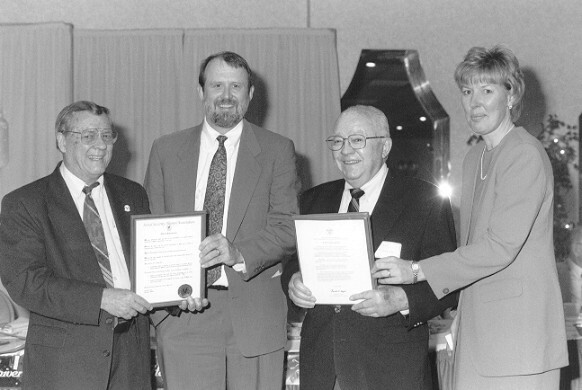 Jack, along with Alumni Association President Ed Tall (far left), and SSA Deputy Commissioner of Communications, Joan Wainwright (right) presented SSA Commissioner Ken Apfel (second from left) with a proclamation named Apfel an honorary member of the Alumni Association. 1998. OASIS photo. The Origin of the "Downey Books"
One of Jack's many innovations at SSA was to formalize the process of collecting and printing legislative histories of Social Security. The printed books became known informally as the "Downey Books," and in this 3 1/2 minute clip from a September 1996 session, Jack explains the origin of the term. From its first founding days, the Social Security Administration was scattered in numerous facilities in Washington and Baltimore. In 1960, the Agency finally moved into a single, consolidated headquarters in the Baltimore suburb of Woodlawn. Jack played a key role in the selection of the Woodlawn campus, and its subsequent growth. In this 5 minute clip, from a session in February 1997, he explains some of the considerations that went into the selection of the Woodlawn site. In the beginning of the Social Security program employers were required to send quarterly wage reports to SSA. For years, employers agitated to shift to a single annual report. Jack was an important voice in opposition to this change, due to the adverse impacts on administration. After Jack's retirement, SSA did shift to annual wage reporting, and the problems Jack predicted quickly became a reality. In this 6 min./22sec. clip from January 1997, Jack recounts his opposition to the move to annual wage reporting. This is an Oral History interview with Jack S. Futterman. The interviewer is Larry DeWitt, SSA Historian. This transcript is the composite of a series of sessions which took place at Mr. Futterman's home in Ellicott City, Maryland, beginning on 7/16/96 and concluding on 2/7/97. The interviews were transcribed from the audio tapes by the staff in SSA's Braille Services Unit. Initial editing was done by Bob Krebs of the SSA Historian's Office. Mr. Futterman made extensive comments on portions of the first draft, which were included in a second editing by Larry DeWitt. The interviewer's questions and any editorial asides are shown in italics to distinguish them from the remarks of Mr. Futterman. Mr. Futterman had a limited opportunity to review and edit the raw transcript, during the Spring of 1998. However, he was unable to find the time and energy to review the entire document. The corrections he made were invaluable; but Mr. Futterman remained frustrated with the text of his interview as he felt it needed more work before it would be in a form that met his high editorial standards. He was, therefore, adamant that readers should know that this document is, in his opinion, a very imperfect account and one that is not fully up to the standards Jack Futterman set for himself throughout his life.